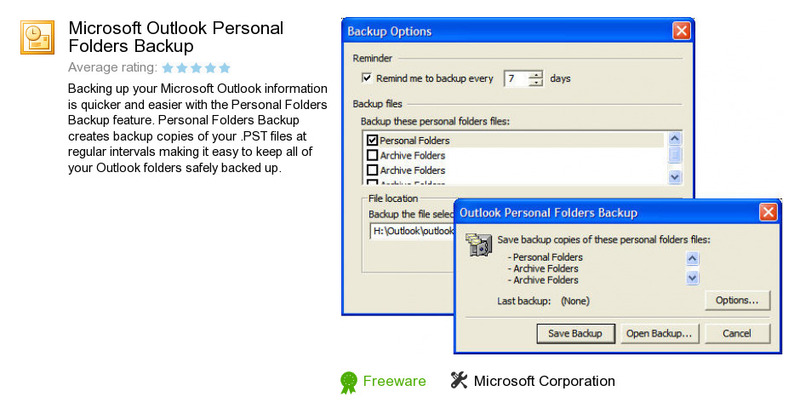 Microsoft Outlook Personal Folders Backup is a program developed by Microsoft Corporation. We know of version 1.1. Version 1.10 is available for free download at our site. Microsoft Outlook Personal Folders Backup distributive has a size of 178,866 bytes. It works with the following extensions: ics, msg, oft, vcf, vcs, fav, xnk. Microsoft Corporation also publishes MPS Report Viewer and Microsoft File Server Migration Toolkit.